scroll down for Library announcements! ﻿﻿Our library website is password protected beyond this welcome page. The one exception is a page titled "Volunteers". Please check with Ms. Ewing, a Barton Hills staff member or the Barton Hills PTA newsletter for the password to access any other website page. Most classes come to the library every week. Books checked out from the library are on a two week checkout cycle, however, we encourage students to bring back their library books every week. Books are marked overdue two weeks from the checkout date. If a student has overdue library item(s), they may not check out any other items until the overdues are turned in, or, paid for. Click the button below for the 2018-2019 general Library schedule. Detailed information is under the "Schedules" tab at the top. A glimpse inside our amazing library! Our library ... looking in the front doors. New furniture for our library! 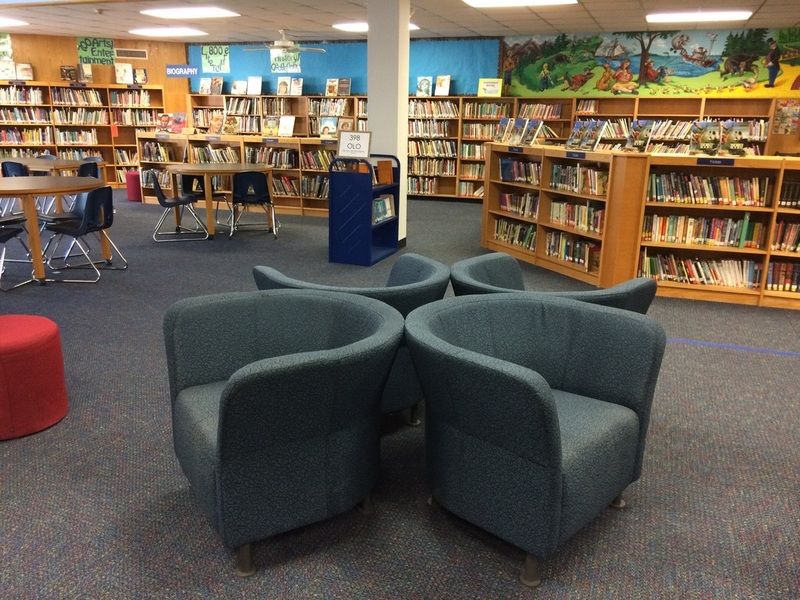 4 comfortable blue bucket chairs and 9 cushiony round ottomans provide plenty of reading space for our Eagles! In this area, we use the tables for instruction and have access to our Innovation Station. The mural in our libary is truly unique! Created in 1967 by Mrs. Akery, the mural challenges us all to name the classic children's books within it. It looks as good today as it did when it was painted. How many classics can you name? Grades 3-5: The Bluebonnet PPI is now due January 9th! both program logs are due january 14th!! ​Barton Hills is participating in the Waves of Pages reading program from Schlitterbahn and the Read to Succeed program from Six Flags! To lean more, click on the tabs at the top of the home page, or click on the blue buttons below. Thank you! BOOK FAIR 2018 was a fantastic success!! thank you for all your support. Volunteers - Field Trip Drivers - Field Trip Chaperones, and more! Act NOW for the 2018-2019 school year! ALL background checks must be re-activated every year! If you were cleared by a background check last year (2017-2018) the background check is INVALID for the 2018-2019 school year unless you reactivate it! Click here to go directly to the directions on how to reactivate your account, or to register for the first time.